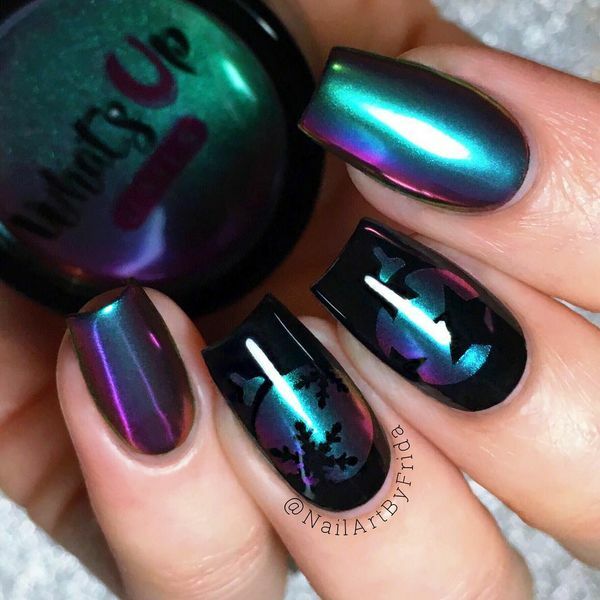 It seems that they’re coming out with a new nail trend we simply must jump on every day now, and we’re bringing you a brand new one in the form of metallic nail designs. We’ve had matte nails for a while, especially with the Kardashians and Rihanna rocking them, but we’re going back to bright and shiny. Metallic nail designs have become one of the most fashionable trends these days. That’s not only because they bring shining to your nails but also because they look interesting and you become the person in the spotlight. That’s why we have collected 40 most eye-catching nail designs for you to try! If you want to be unique, pay attention to every little detail! Especially it deals with a manicure as it can add a classic or a wild look, create a daring or a sweet image. Metallic nails have grown in popularity as their hue can go with any style and event and make you the most fashionable lady at any place. For a winter season, it’s not necessary to go for standard red and white colors. With a chrome powder and Christmas vinyls, your nails will look much more interesting. Happy holidays!